Barbus schwanefeldi common name tinfoil barbs, or tinfoil red tail barbs. They can grow up to 30 cm / 12 inches fully grown. They live in water parameters of PH range 6.5-7.5, temperatures of 24-27 celcius / 75-80 °F. The tin foil barb is a very hardy fish and compared to other barbs can be quite docile in nature. As they get so big it is best not to mix them with small fish. They are not a nippy fish, so they can mix with big none aggressive fish. As they are a very quick moving fish, they can mix with big aggressive fish to, as they would be quick enough to get away. However they can also knock slow moving fish out the way, so this can be a problem mixing with anything to slow. Plus they can also knock in to the sides of the tank, so longer bigger tanks are best. They will eat any food you put in, like flake, pellets, or granular foods. Also frozen and live foods are a good treat. 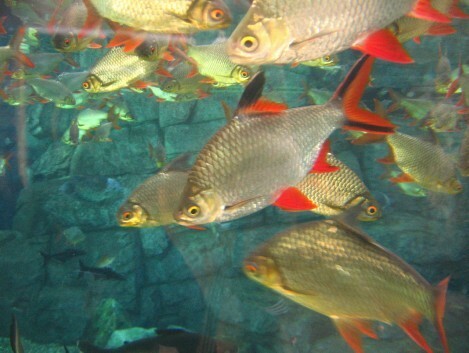 Tin foil barbs are biggish fish but they do not have massive mouths so they will be best with smaller size foods. They will eat any think including plants. But its good to give them some live and frozen foods to keep them happy and healthy. Tin foils only need feeding once a day at the most.